Throughout Galicia, in northern Spain, is fulfilled the annual ritual of cutting the tails of wild horses that live free in the mountains. But is in the village of Sabucedo that the tradition of "Rapa das Bestas" gains strength as international event with the attendance, every summer, of hundreds of fans and curious of this "magic party". The origins of the initiative ride until the sixteenth century, even if the uncertainty about their religiosity dissipates between legends, stories of bravery and the delivery of beasts to St. Lawrence for protecting villages against the plague. After the prayers, "Rapa das Bestas" includes an incursion by the hills to join the wild horses together and the fight that puts men - and women – and animals to measure forces indoors the Curro, that at all resembles a gladiatorial arena. The goal is to let the horses immobilized on the ground for them tails and manes to be cut. Similarities with the handle of bulls in Spanish lands will not be just a coincidence. Although there are groups against holding of this tradition, against the struggle between wild horses, against the abusive cutting of their tails and manes, the "party" continues, maintaining belief in a ritual that celebrates the strength of the inhabitants of Sabucedo to, for centuries, protect their animals against men, wolves and fireworks. 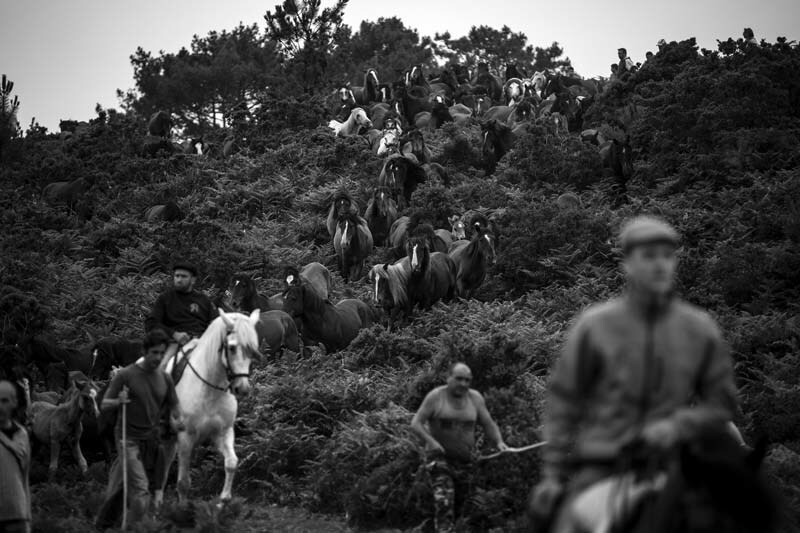 Young and old take part in the search and when they feel they have rounded up as many horses as possible, they had back down the mountain to Sabucedo.